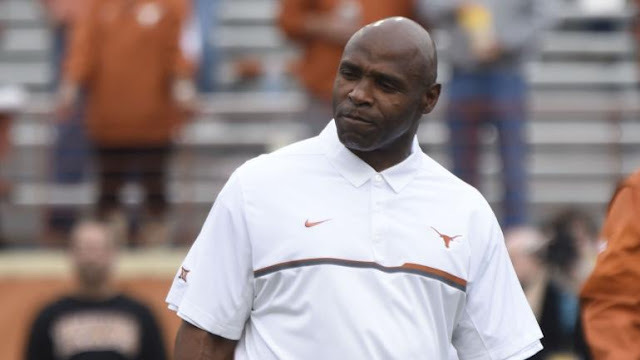 Shirts With Random Triangles: Texas fires Charlie Strong, will reportedly hire Tom Herman as its next head coach. Strong was 16-21 in his three seasons at Texas. He took the Longhorns to the 2014 Texas Bowl in his first season, where they lost to Arkansas 31-7. Heather Dinich of ESPN reports that Texas will hire Houston coach Tom Herman to replace Strong, although no official statement from the school has been made. I have confirmed, per a source close to the situation, that Texas will hire Houston coach Tom Herman. Release expected later today. Strong's last game as Texas head coach was on Friday, when TCU defeated the Longhorns 31-9. Herman led Houston to a 9-3 regular season record during the 2016 regular season. The Cougars were defeated by Memphis 48-44 in the final game of the season on Friday.